One of the email addresses that intrigued me the most a while ago was the one I received from Whoisylvia@aol.com. I immediately thought of Schubert’s song based on Shakespeare’s Two Gentlemen of Verona (“Who is Silvia”) and this is the only reason why I opened the message. Good that my love for music saved me from discarding an email from somebody I only knew by her real name, Sylvia Paull. She is a “Silicon Valley Public Relations Icon,” as Alan Deutschman puts it in an article for Fast Company: “One of the most effective behind-the-scenes connectors in the Valley, Sylvia Paull, started out throwing some of the hottest parties at computer-industry conventions in the ’80s. Now she links the hard-core geeks, entrepreneurs, media insiders, and the political activists, too (http://www.fastcompany.com/magazine/115/open_features-innovation-scouts-who-is-sylvia.html). She landed “accidentally,” as she says, in the high-tech industry in 1986 at Software Ventures, the provider of MicroPhone, a best-selling telecom software for Macintosh, became their Marketing Director of Software, co-produced Science Editor, a CBS radio show about science, freelanced for Wired — until she started Berkeley Ventures in 1994, an umbrella company hosting the amazingly varied PR, party-organizing and connecting activities for which she had already become famous. She is, just by herself, a huge organization. She knows everybody in the high-tech industry and while, for most, PR is about skillful schmoozing and opportunistic networking, Sylvia genuinely loves people, remembers them with a stunning precision — and is equally excited whether she speaks of a still unknown entrepreneur (even Halsey Minor used to be one of them), a celebrity or a cause. Granted. She doesn’t like everybody — in fact, she dislikes impostors (and successfully avoids them). Be honest with me, or I can’t be your representative to the media and the public… I had a ” catch up” lunch with Sylvia at Eccolo in Berkeley a few days ago. I hadn’t seen her for almost a year — suffice to say that it’s an eternity in her life. She quickly took a sip of sparkling water and started full speed on the Meridian International Sports Cafe’s next event, a big gathering on the 4th of July: “They have a great place with seven big screens. We’ll look at the 15km trial race of the Tour de France. Lance Amstrong is back in the Tour. He supports Levi Leipheimer, a Santa Rosa resident… The Tour starts from Monaco, goes through gorgeous places such as La Turbie or Roquebrune-Cap Martin to come back to Monaco. I have invited every single East Bay bicycle club to come, and then the Berkeley Fireworks starts at 9:30 P.M. It’s on the same street. So I am going to lead all the cyclists on a promenade down University to the Berkeley Marina where we are going to all watch the Fireworks. We want to make it an annual event.” Yes, Sylvia is “crazy about bicycling.” She even used to race competitively. “This year I did the PR for Bike to Work Day. Got big story about it in the East Bay Express. Any bicycling advocacy, I do for free.” And her son, Evan, currently working towards his Ph.D, in Bioinformatics is an experienced cyclist amateur bicycle racer for the Palo Alto/Webcor team too! Sylvia is as entrepreneurial as the entrepreneurs she represents and as dedicated and devoted to their mission as the entrepreneurs themselves. But if your company doesn’t know what it stands for, don’t expect her to act as an ersatz. Great PRs and communicators help companies stage their story, but won’t make it up — unless they have no credibility as PRs in the first place. “I often ask entrepreneurs why they think they need more money than they have right now. And most of the time, they don’t know. They just say ‘Oh well we need a few millions just in case, because, you know, if the product doesn’t work or doesn’t sell, we need a backup, we need a cushion.’ A cushion to do what? No one else thinks that way. It’s a strange mentality. So, I sort of have of preview of what VCs are going to see before agreeing to represent them. I challenge them. I ask ‘Why would any one care about your product, who would want it, who’s the competition. Why is it any different than what’s out there on the market’. Some people resent that. That’s good. My whole premise is that you have to be honest with me, or I can’t be your representative to the media and the public.” You only get the PR you deserve and if you want Sylvia, get your act together: “I recently spoke to a freshman class at UC Berkeley entitled Entrepreneurship 101,” she wrote on her blog last April. “They all asked me questions in an attempt to figure out why some of my high-tech clients were successful, as if there were a magic formula they could follow. I told them basically what the Austrian author Robert Musil told all of us: check out what you really want to do and what you’re good at. That’s all you need to know, and the rest will follow. (http://whoisylvia.typepad.com/my_weblog/2009/04/the-human-condition-parallax.html). Sylvia’s Magic… There may not be a magic formula for success per se, yet, there is some magic somewhere, Sylvia’s magic. The unusual breath and depth of her culture enables her to understand an amazing range of domains, get into and to the mind of the most diverse set of people — and identify the real innovators, those who do not reinvent the wheel. Her personal style, a uncommon cocktail of baroque and minimalism, laid-back sophistication and go-getter DIY, as well as her down to Mars and down to earth traits, makes her feel comfortable anywhere she wants to be — and makes people around her feel comfortable. Plus, no matter how serious she has to be, her ability to laugh and her witty commonsense brighten up the most high-strung faces. She is the ultimate Berkeleyan in two ways. She is hyperlocal; the Hillside Club (http://www.hillsideclub.org), founded by a group of Berkeley women at the end of the 19th century is where she hosts her Cybersalon; deeply involved in her community, she is a typical representative of the InBerkeley life (http://www.inberkeley.com), a site that that Lance Knobel and Dave Winer started a few weeks ago. Look at the title of her own blog: “Berkeley Blog, a sane place within an insane society.” She is hyperglobal too, as Berkeley has always been, thus attracting people whose heart can be anywhere in the world. Sylvia was the first US citizen born in a US Army hospital in Germany after WW II. Her father, Oliver Margolin, a Jew from Long Island who had graduated from Oberlin in viola and become a conductor, had joined the Army to make a living and was then Eisenhower’s band conductor (he met her mother, a German Jew born in Poland and a Holocaust survivor in Frankfurt). She fondly recounts the family’s trip with the band throughout Northern Europe when she was a child, before settling in Los Angeles and San Francisco, while the t-shirt she thought up, A Woman’s Place Is on Top, to help finance the first American all-women’s climb to Annapurna I, led by Arlene Blum, her roommate at Reed College, dangles in her memory — which leads her to tell me of another Berkeley event. She is still thrilled by the success of the first Multicultural Women’s Leadership Conference she helped publicize for EngageHer (http://engageher.org) last March, and for which they had legends of feminism such as Gloria Steinem and Dolores Huerta. Yes, no matter how ubiquitous the Web, Berkeley remains a place of choice for people with causes — and Sylvia, as she tells their story, becomes part of the story. She supported Move on (http://www.moveon.org), co-founded by Joan Blades, who also created MomsRising (http://www.momsrising.org ) in 2006; she founded Gracenet, a networking group for women in tech that launched the successful “disgraceful award in advertising” campaign to eliminate sexist advertising; she helped the Electronic Frontier Foundation (http://www.eff.org), co-founded by John Perry Barlow, John Gilmore and Mitch Kapor in the 90’s and living unabatedly with our time, she is hosting a Cybersalon on July 29th for Scott Rosenberg’s book, Say Everything: How Blogging Began, What It’s Becoming, and Why It Matters, to be released on July 7. 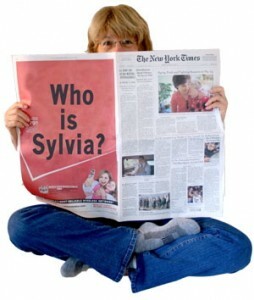 Time goes so fast when you chat with Sylvia! Her reserve of enthusiasm seems infinite. As we were finishing our beignets with a chocolate sauce, she told me about the Big Ideas Fest that she helps organize for the Institute for the Study of Knowledge Management in Education (http://www.iskme.org) in Half Moon Bay on December 6-8… and a few minutes later, I found out that her father, who after 20 years in the Army and after working toward a Ph.D. in musical education became a music therapist, and had one of the most remarkable violinists of the 20th century as his client, Jascha Heifetz (1901-1987). I asked Sylvia if she had ever met him: “Of course!” she responded cheerfully.